Well, that was interesting, to say the least. It's been a while since I read a YA thriller and was pretty pleased with how Elston handled it. 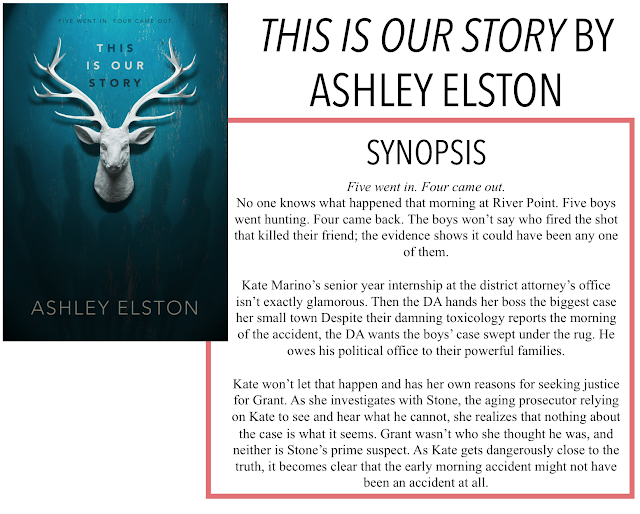 I am back with another book review, today it is This Is Our Story by Ashley Elston. This story follows the River Point Boys - deemed as such after one of the five is found dead after a morning hunt gone wrong. None of them will step forward as Grant's killer so they all remain silent. When the case goes to the small town's DA, Kate, who's interning with one of the lawyers there, gets access to information that might help solve the case. But no one knows that Kate knew Grant, they had been texting for weeks. As she dives deeper into the crime, she realizes that justice needs to be served for the boy she fell for. But maybe things weren't as simple as a hunting accident, and maybe the boy she was texting wasn't who he said he was at all. Initially, I was worried that this was going to be another one of those teen/high school rogue detective situations. Luckily, Elston cleverly avoids this issue by having Kate work for the DA's office, so her snooping is (mostly) sanctioned. Having her have a job also took away from the fact that she was only in high school, and cut out the amount of time we have to read about school. Personally, I think I'm getting a little tired of all that unrealistic high school drama so this was a welcome surprise. The story is told in three perspectives: the first being a (largely) plural second-person narration from the Boys which helped solidify the idea of them as a collective group, what they were going to do, etc. The next was Kate's first-person POV. This took up the majority of the novel and was fairly informative. The third was transcriptions of police interviews interspersed throughout the novel. These helped paint the bigger picture as to what happened the night before, and what lead to Grant's death. While I applaud the uniqueness of this story, there were times when I just wanted to figure out who did it for myself, but that was basically impossible because the Boys were usually referred to as a collective. I don't really think I could tell you one characteristic about each of the four of them, except maybe Shep, who was singled out later on. This was a really interesting take, and it helped prevent me from predicting who did it early on, but it literally could have been any one of those boys. When the final verdict is reached, I didn't feel vindicated or all that satisfied, because I knew nothing about who did it. He was just a member of the group, the motive was briefly explained, but it seems like you could find a motive for any of the four of them. In terms of writing and pacing, I think the story was fairly well-written if a touch slower paced than I would have liked. It wasn't necessarily that noticeable, but there were just times when I thought things could be going a bit quicker. The writing itself was easy to understand and accessible, the lawyer talk was well explained and made easier for Kate - and by extension the reader - to understand. Overall, I did quite enjoy this book and found it a refreshing take on teen thrillers.